(NaturalNews) Almost everyone believes in some form of spiritual cause and effect. In the realm of New Age belief, it's called "karma," and your actions are believed to be recorded in the "Akashic records" for which you are one day held to account. In traditional religious belief, it's called "judgment from God," and it involves death and destruction being rained down upon those societies that have deviated from the Biblical tenants calling for protection of life. Following physical death, every individual is judged by God for their actions on the Earthly realm, and if they allowed evil to take place -- or engaged in it themselves -- they are harshly judged. In the realm of mind and intention, a similar phenomenon is often called "the Law of Attraction," and it means that society tends to attract to itself those things upon which it repeatedly focuses. Across our world, the vast majority of people everywhere believe in some form of spiritual cause and effect. This is true even among "progressives" in America, yet it is precisely those progressives who are right now defending, promoting and even encouraging the practice of abortions... a practice that not only destroys the life of a living, conscious being, but also a practice that we now know involves the for-profit harvesting of babies' organs during abortion procedures. 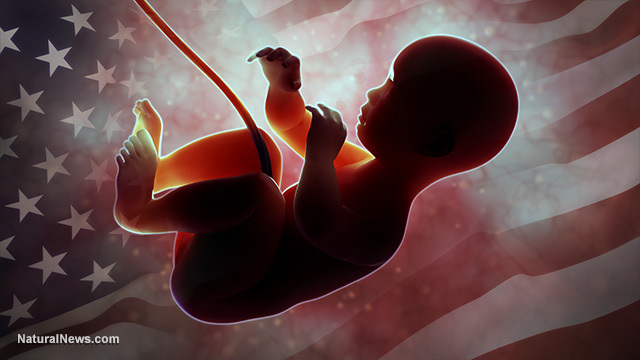 Evidence is even emerging now that says some children are born whole, killed by Planned Parenthood, and sold as intact, whole bodies to biotech companies that use the infant bodies for so-called "scientific research." This article is not attempting to convince you that such activities are now routinely taking place in America. That fact is irrefutable by all but those who are mentally ill and living in a state of total fantasy. Rather, this article attempts to explain that there is a spiritual price to be paid for this systematic murder and destruction of life. To the absolute astonishment of almost everyone, there are 115,000 abortions performed EACH DAY around the world. The New England Journal of Medicine says that 1.3 million abortions per year in America (3,561 per day). What the Aztecs did not realize is that by committing large-scale human sacrifice, they were programming their reality for death and destruction. That destruction eventually arrived in the form of invading Spaniards, and the last Aztec emperor, Cuauhtemoc, surrendered to the Spaniards in 1521. A person who does not understand the holographic nature of reality would incorrectly assume that one thing has nothing to do with the other. How could the Aztec's human sacrifice impact their civilization being destroyed by the Spaniards? What more awake and aware people have come to realize, however, is that violence attracts violence. By murdering their own citizens, the Aztecs set into motion what you might call "ripples in the Matrix" which, over time, attracted to their civilization the same sort of violent actions that reflected their own murderous ways. This idea makes no sense to materialist scientists, of course, but the views of those people don't count because they, themselves, do not believe in free will, consciousness or the power of the mind. They believe that all human thought is deterministic brain chemistry and that consciousness is merely a convincing illusion. By definition, they believe that their own thoughts and words mean nothing and merely represent autonomic expressions of complex brain chemistry. But to those who have moved beyond the limited, materialistic understanding of existence, they know that intention has consequences... which is precisely why prayer has been scientific proven to accelerate healing in hospitals. It's also why there exists a "hundredth monkey" phenomenon whereby once an idea or piece of knowledge exists in the minds of a critical mass of conscious beings, that knowledge or idea somehow spreads to others through a kind of "consciousness osmosis" effect that still isn't well understood. Sheldrake describes the existence of "morphic fields" which are energetic templates that provide the framework or blueprints from which biological and physical reality is formed. This theory of morphic resonance is the best explanation yet for many phenomena in the world of embryology and botany which cannot be explained by classical reductionist science. Even the entire assembly of DNA in a human body is utterly incapable of describing the magnificent complexity of the construction and ongoing life of a biological being. Thus, the material explanation for inheritance is incomplete. While DNA clearly plays an important role in inheritance, it is not sufficient by itself to account for all inheritance. As a hint into this, consider the fact that the DNA of a simple fruit fly contains about 13,300 genes. The mustard weed plant contains 25,700 genes. According to these numbers, a human being -- which is many times more complex than a fruit fly or a mustard weed -- must contain hundreds of thousands of genes, right? Wrong. The human genome only contains 30,000 - 40,000 genes, less than twice the number of genes as a mustard weed. This astonishingly low number of human genes is one clue that DNA alone is not enough to describe the complexity of a human being. There is something else above and beyond DNA that sets the template for "formative causation." Almost certainly, this is a little-understood non-material "field" -- perhaps a field of "naturally-occurring intention" or a type of natural consciousness we don't yet comprehend. Narrow-minded scientists predictably scoff at such notions, because they are incapable of expanding their knowledge beyond those things they've been taught through rote memorization. But they aren't even true scientists. As physicist Richard Feynman famously said, "Science is the belief in the ignorance of the experts." In other words, Feynman correctly believed that REAL science is grounded in the idea that "experts" are not just wrong, but consistently wrong because they are incapable of exploring new advances that might overrule their existing limiting beliefs. What's the point in all this? The point is in realizing that abortions may "program" the morphic fields for the causative formation of DEATH. In other words, the more killing of conscious beings that takes place -- whether through abortions, violent crime or large-scale warfare -- the more strongly the morphic fields might be programmed for violence and destruction. This may, in fact, be the very mechanism that accounts for what New Agers call "karma." Or may also explain what the Scripture refers to as the Shemitah, or even "Judgment Day." When you program the morphic fields of reality with violence against children, the terror of being murdered, and the systematic destruction of life, you inevitably unleash unintended consequences in the morphic fields of causitive formation. By programming these fields with violence and destruction, a society is, in effect, pushing itself in the direction of wholesale violence and destruction against itself as a matter of cause and effect. In everyday language, this idea is called, "You reap what you sow..." yet the underlying mechanism that powers this idea is deeply spiritual... perhaps even "cosmic." The bigger question on abortion: What are the consequences for human civilization? All this leads us to the greater spiritual question on abortion. Is the widespread practice of murdering living, conscious beings programming human civilization for death and destruction? The very question might seem preposterous to someone uneducated in the presence of morphic fields and the nonlocality of consciousness, but it remains and legitimate and serious question for our world, especially given the horrifying number of abortions carried out every day across our planet. • The possibility of an Earth strike from an extinction-level meteor. • The eruption of the Yellowstone caldera, which would end much human life across the planet. • The arrival of violent, intelligent alien life that would seek to exterminate human life (warned by Stephen Hawking). Yet what if there is another threat that has gone entirely unnoticed by modern science? What if the systematic, hour-by-hour murder and destruction of unborn human babies is actually setting into motion a pattern of "causative formation" which might attract an extinction-level event to modern human civilization? The Bible speaks of a great flood that wiped out evil and cleansed the Earth. The story, like much of what's contained in the Bible, is a metaphor, not a literal telling of specific details. Yet it follows the pattern of precisely what we're exploring here: a great catastrophe that befalls human civilization, washing away the evil to start anew. Interestingly, according to the morphic resonance theory, the idea of God isn't even necessary for humanity to doom itself. Through mass abortions, humanity is programming the morphic fields with the intentions (conscious information) of death and destruction. That intention sooner or later is reflected and multiplied, resulting in the catastrophic destruction of the very human civilization that condoned and promoted the mass murder. No divine judgment is required in this explanation; merely cause and effect. Some people believe that morphic fields and the so-called "conscious universe" is synonymous with God. This explains why "God" is omniscient and omnipotent. The morphic fields are everywhere, surrounding us and coexisting with us, reflect back to us the energies and vibrations that we program into them. Perhaps the fields are an expression of conscious intention from a highly advanced divine being or civilization that gave rise to our own universe by planting "Big Bang seeds." Interestingly, even the most rigid materialistic scientists readily admit that the Big Bang occurred in utter violation of the laws of cause and effect, bringing into existence all matter and energy in the known universe in an instant! There is no explanation for such an event other than the conscience intention of an intelligence beyond our comprehension. To wrap this up, even if everything mentioned in this article seems too far-fetched to believe, abortion is wrong for ethical and moral reasons. It is unlikely to ever be stopped, however, as far too many people resort to abortion as a form of birth control. A nation that murders 3,500 babies a day, it turns out, may ultimately be murdering itself. Those who condone such practices may be accruing tragic consequences for their own non-material souls. And finally, America may be facing a day of spiritual reckoning for routinely murdering so many conscious beings.